For decades, ASI Computer Systems® has been building business management software designed specifically for the promotional products industry. Created for Our Industry. Designed for Your Business. 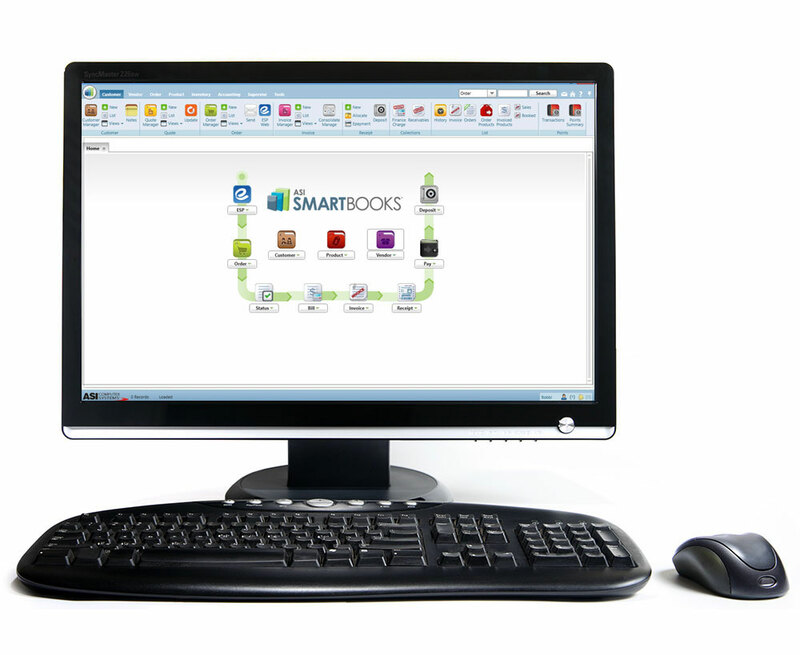 ASI SmartBooks® is the must-have business software that manages ALL of your back-office operations. From sourcing to sales to accounting, one application does it all – and more – including integration with ESP, the industry's #1 product database, and popular payment processors like Authorize.net and PromoPayment™. Trust ASI SmartBooks, the smart software made for our industry and for you. ProfitMaker is one of the most efficient business management solutions designed specifically for the promotional products industry. We created ProfitMaker® to address an entire set of intricate business processes in a single, flexible, powerful application that integrates with ESP. Our staff consists of highly skilled and knowledgeable business professionals devoted to addressing your business needs quickly and accurately. From conversion and integration services to custom programming, our technical service team members are available to help your office run efficiently. Boost productivity and profitability with our fully integrated general ledger that automatically updates while you do your work. Streamline everyday processes into simple tasks with our enhanced workflows that increase efficiency for your business. Take charge of your inventory with real-time data that allows you to analyze, release and replenish your stock. Whether distributor- or client-owned, keeping track of your inventory has never been easier with our customizable reporting options. Customize the order workflow process to incorporate your procedures and maximize productivity. Tailor activities for each step in the order process to stay up-to-date with the progress of the order. Have a repeat order? Simply copy into a new order with the click of a button. Track critical data like customer buying habits and marketing costs by generating customizable reports to get the data you want, when you want it. Significantly reduce the time it takes to calculate and pay commission with direct integration in the order process. Streamline the accounting and business functions that coincide with customer inventory programs. Administer programs, create customized wearable matrixes, freight and shipping management – these are just a few of the features our software gives you. Our eCommerce module allows you to integrate your web stores directly to your software. Orders generated on your websites are imported into your software without the need to rekey data. Inventory levels, descriptions and pricing are updated on your sites as changes are made in the software, eliminating the need for a web designer. Short for Electronic Data Interchange, EDI transfers documents from one computer system to another. You don't have to worry about incompatible computer systems by using ASI/EDI information. Data is communicated quickly, efficiently and accurately. Cost Efficiency – Reduce paper volume and see immediate savings! No more rekeying orders means less administrative costs. Increased Speed – Electronically exchange documents with your business partners instantly so you spend less time processing orders. Improved Accuracy – Eliminate manual data input errors. Become a preferred vendor for your clients with the Punch-Out Site integration. Customers can purchase products from your ASI Computer Systems eCommerce web store while using their own procurement software. Larger organizations use procurement systems to manage purchasing. We’ll help you integrate directly with their purchasing system so you can provide buyers with real-time catalog information (current pricing and product availability) and paperless order processing. ASI Computer Systems has been an integral part of the promotional product industry since 1969. We understand the fundamental differences between promotional product suppliers and distributors. Our team has utilized this key knowledge of the industry, as well as our partnership with ASI®, to shape our software packages into the most efficient business management solution available for your business. Our current openings are displayed below. We welcome you to inquire about any position that interests you. Feel free to send us information about yourself even if a particular position is not available. We're always seeking qualified professionals to join our team. We are looking for a senior-level .NET developer. The ideal candidate should have extensive experience in the design, architecture and implementation of large-scale development projects. We? 're looking for someone who can evaluate and produce solutions to application issues. Bachelor?s degree or higher in Computer Science or related field, or equivalent work experience in a related field. 4+ years of hands-on experience designing and implementing WPF front-ends required. 4+ years of hands-on experience developing applications using VB.Net or C#, Linq, XML, web services. 5+ years of hands-on experience writing complex queries, stored procedures and working with highly relational data models using SQL Server. 7+ years hands-on development experience, preferably in a commercial software development environment utilizing OOD and n-tier design architecture. Benefits include insurances, paid time off and 401k. Attach your resume and send via email to Loriet@asicomp.com. Place the job title or area of interest in the subject line of the email message. If you're considering ASI SmartBooks to help you find, win and keep customers, or just want more information, we're happy to answer your questions. Simply fill out the form, or for immediate assistance, call us at (800) 544-1274. Simply fill out this form, and we’ll be in touch right away.